Telkom is the largest provider of Internet service in the country of South Africa. You'd think that data delivery would be especially speedy over its network, right? Well, Unlimited IT wasn't satisfied. So on Wednesday it conducted an experiment: using an 11-month old carrier pigeon to send data from the company's office near Pietermaritzburg to the city of Durban, 50 miles away. A data card was strapped to the pigeon's leg and sent on its way. 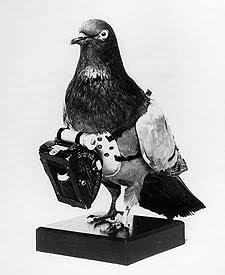 As Winston the pigeon was flying out the window, Unlimited IT began transmitting the same data via the Internet to the Durban location. Winston the pigeon arrived 1 hour and 8 minutes later. The data was downloaded upon arrival. The complete transfer took 2 hours, 6 minutes and 57 seconds. By that point, Telkom had only delivered four percent of the same data! Chris, can I use a photo of yours, any of your choosing, for my article in ArtBeat Oklahoma? I'm writing a blog review of your blog and I would love an image to go with it. Thanks. I'm still trying to figure out the airspeed velocity of an unladen swallow.